Budget stay prides itself on being able to provide business, government and leisure travellers with budget Canberra hotel, motel and serviced apartment accommodation at the cheapest possible rates. On this website you will be able to book online directly with a number of different hotels and apartments in Canberra and nearby Queanbeyan and get quality accommodation at the cheapest discount rates that are available. The Brassey of Canberra is located within the central, quiet, leafy tree lined suburb of Barton. Set in 2 and a half acres of lawns and gardens on the fringe of the parliamentary triangle the Brassey Hotel is conveniently positioned within walking distance to many of Canberra's Tourist attractions, including the National Gallery of Australia, the new and old Parliament Houses, the National Science and Technology Centre (Questecon), the High Court of Australia, the National Library and Lake Burley Griffin, as well as the Kingston & Manuka shopping villages. The Brassey Hotel in Canberra is also only a short 7 minute drive to the city Centre, the Canberra Airport is just 10 kms away and Kingston Train Station is just 1km away. Providing excellent apartment and hotel accommodation on Belconnen Way, this accommodation is only 10 minutes drive from Canberra City and is adjacent to the local shops. If you are looking for value for money hotel accommodation in Canberra then the Belconnen Hotel Motel and Serviced Apartments is the ideal place for you. This budget hotel features a variety of rooms that are designed for maximum comfort, as well as great amenities like conference centre, direct internet access, disabled facilities, faxing facilities, free car parking, lift, restaurant, room service, tour desk, 24 hour reception, daily housekeeping and express check in/out. With lots of interesting and exciting things to see and do in and around Canberra guests who choose to stay at the Belconnen Hotel Motel and Serviced Apartments will be well positioned to see them all. This budget Belconnen accommodation provides business and leisure guests with fully self contained apartments that are spacious and well equipped, as well as great hotel facilities that add to your accommodation experience. The Canberra Furnished Accommodation provides a wide variety of modern studio, 1, 2 and 3 bedroom self contained serviced apartments in different locations at budget prices. If you want value for money accommodation in Braddon then the Canberra Furnished Accommodation is the ideal place for you. This budget hotel features numerous different tyeps of apartments with all modern facilities, as well as great amenities like direct internet access, faxing facilities, free car parking, guest laundry, gymnasium & fitness equipment, spa, outdoor swimming pool, tennis court, bbq facilities, garden and baby cots available for families. 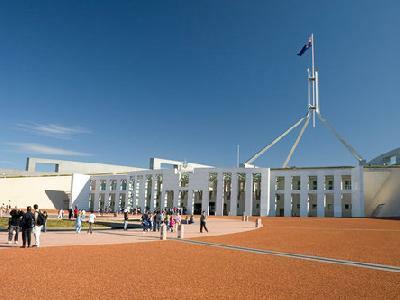 The Canberra Furnished Accommodation is situated within close proximity to the many of the major attractions around Canberra including Questacon, National Portrait Gallery, National Museum, National Library, Australian War Memorial, Parliament House, Cockington Green, Australian Institute of Sport, Lake Burley Griffin, National Zoo and Aquarium. The Forrest Hotel and Apartments in Canberra gives travellers excellent value for money with a range of comfortable hotel rooms and 1 and 2 bedroom self contained serviced apartments at cheap prices. With easy access to all of the major tourist attractions in the Canberra region the Forrest Hotel and Apartments is the ideal place for your next budget accommodation. It also features numerous guest services and facilities including lounge bar, conference centre, direct internet access, free car parking, guest laundry, restaurant, room service and tour desk. For a long time business and leisure travellers have been staying at the Forrest Hotel and Apartments because of its unique home away from home feeling. Also the friendly and knowledgeable staff and excellent array of facilities at these budget Forrest apartments will ensure that your stay in the city is completely trouble free. The Parkway Motel is situated an easy distance from the Canberra CBD in the city of Queanbeyan. It provides a range of affordable and comfortable motel accommodation and is an ideal spot also if heading to the Skifields in winter or travelling to the South Coast of NSW. With a great, central location close to everything that Canberra has to offer the Parkway Motel is a popular accommodation in Queanbeyan for travellers of any budget. This Canberra property features a wide range of accommodation and facilities like disabled facilities, faxing facilities, free car parking, guest laundry, bbq facilities and lanscape garden, which makes it a popular place to stay with all types of travellers. With convenient access to everything around Canberra due to its central location the Parkway Motel offers travellers a range of hotel accommodation that is near the Parliament House, old Parliament House, Australian War Memorial, National Museum, Australian Institute of Sport, Cockington Green, Telstra Tower and Kingston shopping. Canberra Short Term and Holiday Accommodation Serviced Apartments ( formerly the McMillan Gardens Furnished Accommodation, Canberra) offers 3.5 star studios, 1 & 2 bedroom self contained serviced apartments in Griffith, 5km from the Canberra CBD. The Canberra Short Term and Holiday Accommodation is well located in Griffith, meaning that it is close to everything that the city has to offer. As well as this the property also has numerous guests facilities and services including direct internet access, free car parking, guest laundry, outdoor swimming pool, BBQ facilities, landscaped garden and baby cots for hire. Location, location, location. The Best Western Motel Monaro - newly refurbished hotel motel accommodation at affordable rates with friendly service in a great Canberra location. The Best Western Motel Monaro offers 3. The Best Western Motel Monaro is well located in Kingston, meaning that it is close to everything that the city has to offer. As well as this the property also has numerous guests facilities and services including direct internet access, faxing facilities, free car parking, tour desk, baby cots for hire and daily housekeeping. The Alivio Tourist Park Canberra provides guests with accommodation in the heart of Canberra city. It is a self contained holiday village, offering a variety of accommodation styles including motel rooms and self contained 1 & 2 bedroom cabins. With a great, central location close to everything that Canberra has to offer the Alivio Tourist Park Canberra is a popular accommodation for travellers of any budget. This Canberra property features a wide range of accommodation and facilities like direct internet access, free car parking, guest laundry, outdoor swimming pool, tennis court, bbq facilities and baby cots available for families, which makes it a popular place to stay with all types of travellers. With easy access to everything in Canberra and the surrounding precincts because of its central location the Alivio Tourist Park Canberra offers travellers a range of apartment accommodation in O'Connor, which is just a short distance from the Telstra Tower, Australian Institute of Sport, Canberra Stadium, Australian National University, Canberra University, Lyneham Sports Centre, War Memorial, Questacon, National Gallery, Parliament House and Old Parliament House. Affordable & comfortable motel accommodation in a bushland setting is what the Red Cedars Motel is known for. It provides the perfect accommodation base close to Dickson shopping and restaurant precinct, Kamberra Wines & Canberra Racecourse, and only a couple of minutes walk to Exhibition Park. With a great, central location close to everything that Canberra has to offer the Red Cedars Motel Canberra is a popular accommodation for travellers of any budget. This Canberra property features a wide range of accommodation and facilities like direct internet access, faxing facilities, free car parking, guest laundry and bbq facilities, which makes it a popular place to stay with all types of travellers. This Watson accommodation provided by the Red Cedars Motel Canberra is ideally positioned only a short distance from lots of popular destinations, as well as interesting things to see and do such as the National War Memorial, Parliament House, National Library, Lake Burley Griffin and Old Parliament House. The Canberra Rex Hotel provides budget hotel accommodation in the heart of the CBD, close to all of Canberra's best shopping, theatres, galleries, museums, restaurants and tourist attractions. Ideally situated in a great city location the Canberra Rex Hotel is within easy reach of all the major attractions that Canberra has to offer. This along with the many guest facilities like lounge bar, conference centre, direct internet access, guest laundry, lift, restaurant, room service, tour desk, 24 hour reception and baby cots available for families is what makes the Canberra Rex Hotel such a great place for a relaxing stay. With convenient access to everything around Canberra due to its central location the Rex Hotel offers travellers a range of Canberra CBD hotel accommodation that is near the Australian War Memorial, Anzac Parade, Parliament House, National Library, National Gallery of Australia, Questacon, High Court Of Australia and much more.